This phrase before is based on a quote from the 1977 film adaptation of H.G. Wells’ short story “Empire of the Ants.” In the revised quote, “robot” replaces “insects,” the idea of the meme being that anything can: llamas, octopi, robo-dogs, you name it. When it comes to AI overlords, the joke hits closer to home. That’s because there’s a real fear that AI will assume godlike qualities, taking over humanity along with our beloved institutions. As a woman of Jewish heritage and faith, I sometimes wonder what the rise of AI will mean for world religion in particular. Though the percentage is surely shrinking, 84 percent of people identified with a religion as of a 2012 Pew study called The Global Religious Landscape. From Galileo to Darwin, discoveries and scientific breakthroughs regarding our planet and universe have challenged religious texts and interpretations throughout history. And yet, religious institutions have persisted. The idea I’m most fond of is that AI will strengthen religion as we know it instead of watering it down. My son has written about the way in which AI will elevate cultural institutions like museums by making them more engaging, educational, and interactive. The same could be true for religious services and place of worship, which have a reputation for stuffy services, inaccessible traditions, and a lack of innovation. AI technology could, for instance, create virtual biblical figures with which people could speak with and learn from. Bots could be “taught” scripture and the ability to offer religious guidance, in or out of the synagogue. Would an autonomous mind, absent a human body, have a soul? Would the religions of the world attempt to convert robots to Christianity, Judaism or other faiths? Theologians and futurists alike are divided on this front, but most agree that even robots must be programmed with some sense of morality. 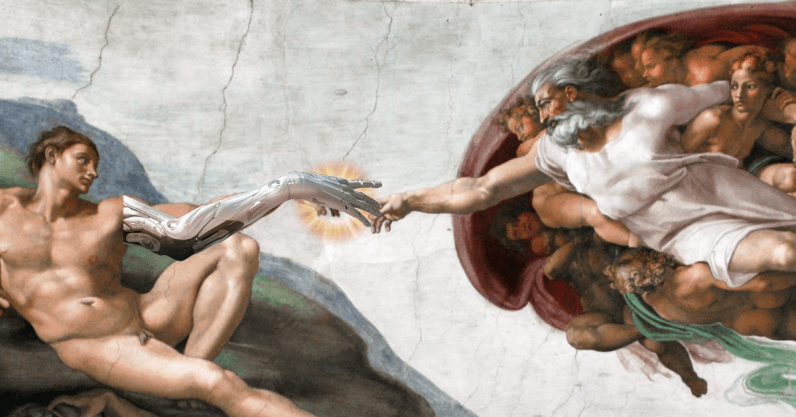 One point of religion is to better ourselves as humans, and AI, regardless of sentience, could also be a tool to help us do just that. Advanced AI algorithms already help spread news of charity to expand the reach of prayer and giving habits through social media. Whether AI is bringing a sacred text to life, spreading the word, modeling godly behavior or helping those in need, as a tool it could enhance the best qualities religion has to offer. If AI does reach the level of super-intelligence, some say the possibility for idolatry would be great. Ironically, humans would be “playing God” while also creating one, or at the very least something that could be perceived as such. Some predict that by the 2040s, an AI god will not only have emerged, but have written its own bible and be worshipped by many. Will humans be inclined to worship our AI overlords? Or worship some form of AI, whether or not it exerts control over humanity? Considering there is already a church of AI, it’s hardly a stretch to imagine this outcome. As of yet, there is no AI god to worship, but the “gospel” centered on its eventual creation is enough to lend this outcome plausibility. Besides WoF, belief in the coming singularity is also regarded as a religion known as Singularitarianism. The singularity refers to a point in time in which machines become so intelligent, human beings can no longer keep up. Those who ascribe to this belief regard it as inevitable and “preach” the need for peaceful transition into this new world, potentially through transhumanism, or the merging of man and machine. Because it is predicated on faith, one might say that belief in this future marks a striking commonality with religion as we know it. The worship of an existing AI would be different because there would be material proof of its existence. In this way, the idea of tangible AI overlords is still outside our comprehension. Lastly, there is the possibility that AI would contribute to the rise of atheism and the eventual dissolution of the world’s religions. In a world fueled by information, globalism, and accelerating scientific advancement, some say we’re on a road to a future where religion is made obsolete. In theory, a super-intelligent AI would be infinitely smarter than humans and have answers to the questions we’ve long asked of religion for direction. Would an AI be able to prove or disprove the existence of a god entirely? Or, as in the Tower of Babel story, would the creation of AI constitute a tower tall enough to reach heaven, causing chaos and abandonment by whatever creator made us? I don’t have an answer, but I do have hope that if AI becomes super-intelligent it will be a force for good in the world, aiding us in becoming more “holy” instead of less — or at least more full of love, regardless of what religion we identify with (if any). We cannot, however, assume that this will be the case. As such we should all take an active interest in when and how AI is created in regards to the aspects of society we cherish most. This way, our robot overlords may not be overlords, but they will be welcome.